After installing the Synthetic SE, you must configure the tt_sse.ini located in <root drive>:ttconfig. This file contains information related to logins and memberships. 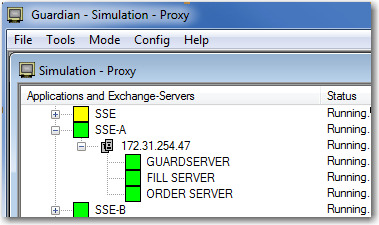 Synthetic SE servers appear in the network as TT Gateway Order and Fill servers, similar to the following. The ExchNameAlias setting in the X_TRADER aconfig.xml file allows you to customize how Synthetic SE appears in the Guardian Exchange tree. Customizing the Synthetic SE name allows you, for example, to provide location-based identifications (e.g., SSE-A (Chicago) or SSE-B (London)). For more information, refer to the TT Gateway Architecture SAM 7.X. No connectivity tests are available for Synthetic SE. Synthetic SE contains an impliedconfig.cfg file that must match the impliedconfig.cfg file on the X_TRADER client machines that want to use Synthetic SE. If the two files are not identical, attempts to launch certain orders from X_TRADER will fail. If an X_TRADER release includes updates to its impliedconfig.cfg file, you must upgrade the Synthetic SE Server. TT strongly recommends that you monitor the Customer Advisories that specifically mention impliedconfig.cfg compatibility between X_TRADER and Synthetic SE.